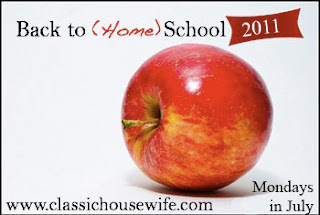 Each Monday in July (or some day there about :) - I will be linking up with Amber over at A Classic Housewife for Back To Homeschool! Here are the topics if you'd like to join too! Our 2011-2012 curriculum choices are based on several factors. 1) We are a part of Classical Conversations group so several of our curriculum choices reflect this decision. 2) My desire is for our family to study subjects together whenever we can. You can find our curriculum choices laid out in detail by clicking on each grade level. 8th, 5th, and 3rd. Something that has been a part of our homeschool since the beginning that I could not do without is my own planning! I love laid out plans but I always tweak them to fit our time and schedule. We use our dry erase board a lot! It's definitely handy and a must have. I looked at the different grade lists, looks like a great year taking shape. Thanks for linking up! Homeschool Mother's Journal - summer!